15/10 Went out with RL on Monday afternoon. Went first to Swine Moor, viewing as usual from Weel Road opposite Corporation Farm. On Sunday afternoon I had found a juvenile Pectoral Sandpiper with Richard Jennings. Also had up 7 Ruff and 6 Dunlin along with the usual flock of Wigeon and Teal. Also that day had the 1st 10 returning Whooper Swans north of High Eske NR on Arram Carrs but didn’t see the Common Crane, Had hoped to get back to Swine Moor earlier but the weather on Monday and Tuesday had not encouraged me. However this afternoon the area was deserted with just the regular Little Egret of note. 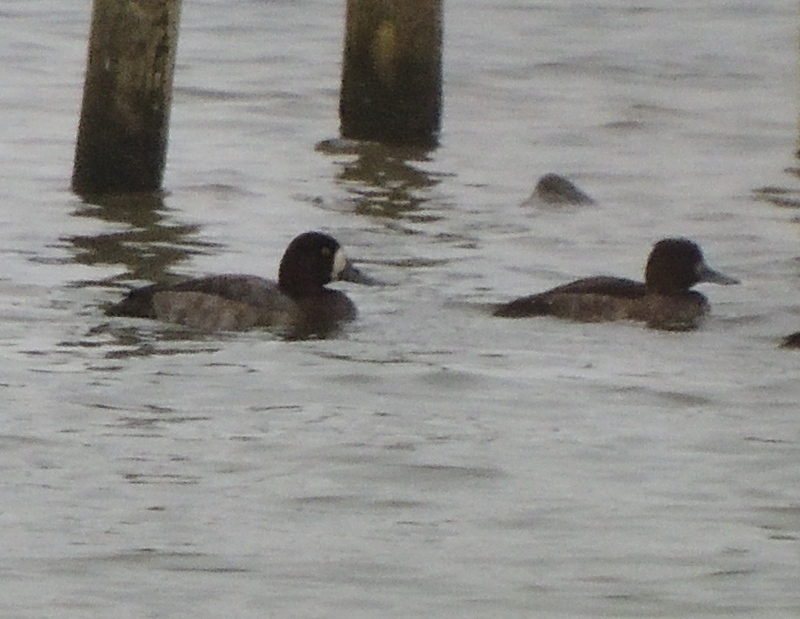 Went to Hornsea Mere starting at Wassand Hide. Met MR on the way down. Had had the 2 Slavonian Grebes off Kirkholme Point and a 3rd bird towards the west end. Also found a Red-necked Grebe and had seen a dying Gannet on “tree island”. Not long after getting in the hide MR picked up a grebe which turned out to be the 3rd Slavonian Grebe presumably pushed into Decoy Bay by a boat. 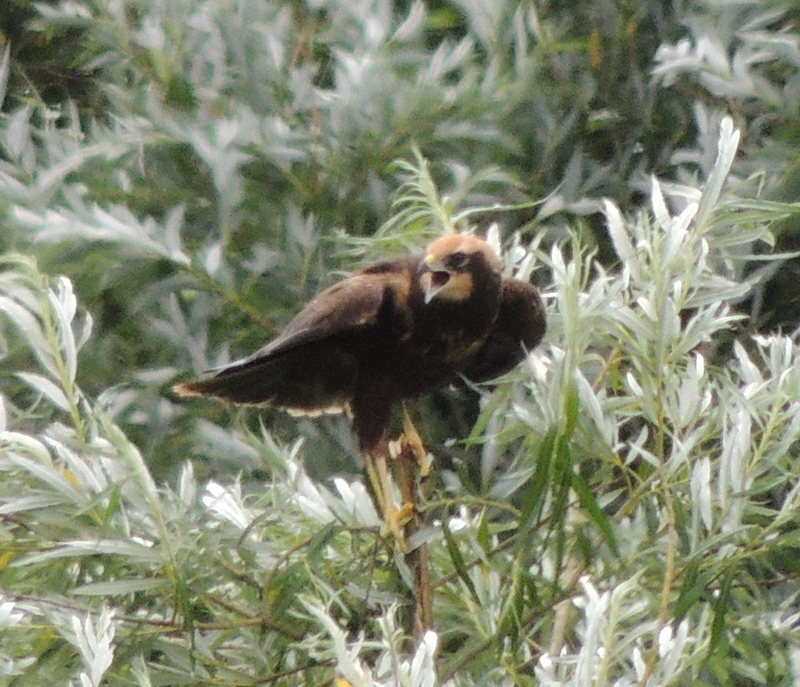 Also a female Marsh Harrier still present. Next went round to Kirkholme Point. Scanning the edge of 1st field, where the other 2 Slavonian Grebes had been seen, picked up a female Velvet Scoter, possibly the same bird seen over the previous 2 winters. Scanning further east I picked up the 2 Slavonian Grebes, then the Red-necked Grebe. 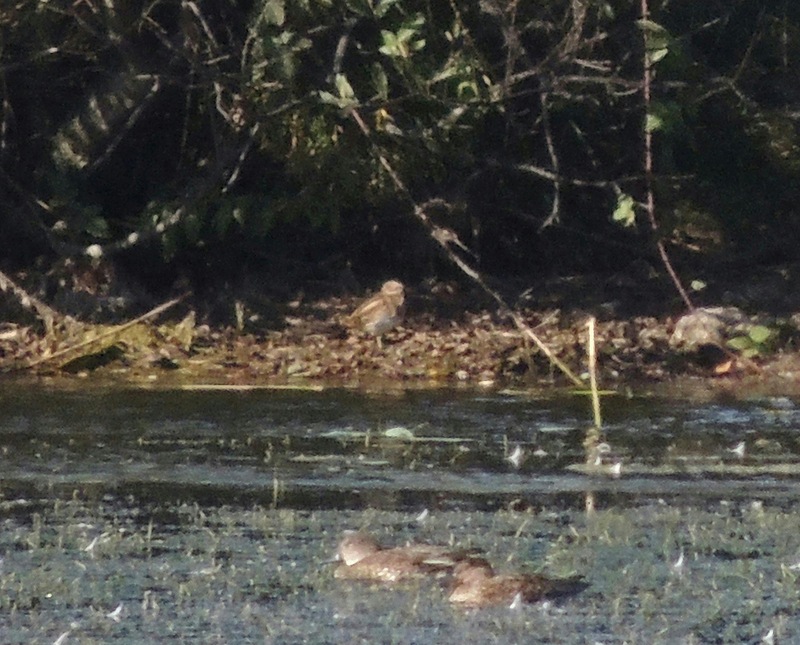 Moved to get closer t0 the latter and had a moment of self doubt when I picked up a Little Grebe. However scanning to the right picked up the Red-necked Grebe again. Also 3 Little Gulls, an adult and 2 1st winters. 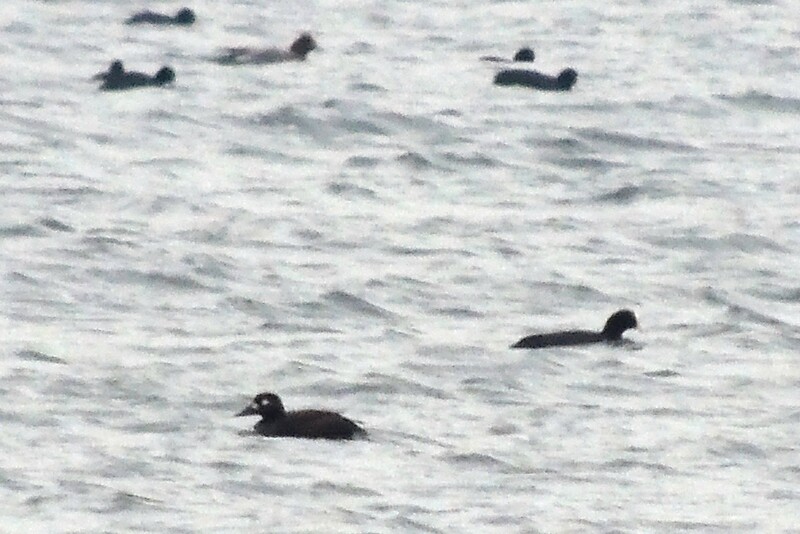 Had texted MR about the Velvet Scoter but before he got to us it was flushed by a boat and we lost track of it. MR had been delayed by a Yellow-browed Warbler calling unseen near Wassand Hall. Finished the day in HVWG Hide. Had the Gannet on tree island. Didn’t look too fit but to quote John Cleese it hadn’t yet “fallen off it’s perch and joined the choir eternal”. Started checking the gulls roost and picked up 3 waders in flight. Pale grey with a strong white wing-bar and was thinking Sanderling or Dunlin when RL reminded me that several Grey Phalaropes had been reported by RBA today. The penny dropped and not long after they landed and there identity became obvious. Tried contacting MR but his phone wasn’t on. For the rest of the time we were in the hide they remained on the water mid-mere and with the fading light would have been very difficult to pick up if you weren’t sitting with us. 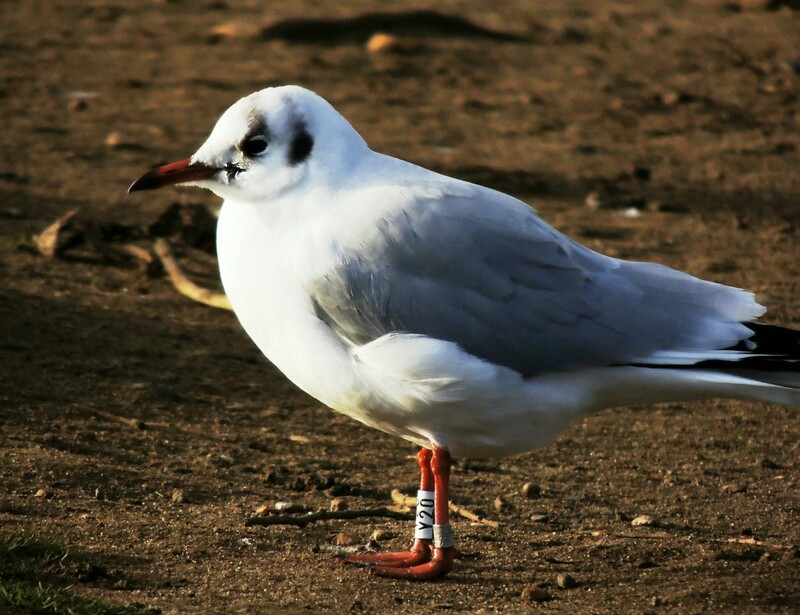 For more recent sighting in the Hornsea area check here. Seems to be an influx of Jay at the moment with bird seen coming in on the coast and evidenced myself by Jays around Cottingham and Willerby this week. Seen at Hornsea Mere today but my been just resident birds. 18/9 On Thursday morning a juvenile Red-breasted Flycatcher was found by Lee Ives in bushes by the slipway at Hornsea Northcliff Boatyard [otherwise known as Atwick Gap]. Managed to get there mid afternoon with RL. Several Merebirders were there and had all had good views but it had been out of views for a while. Walked the bushes by the drain that runs north, flushing a warbler several times which eventually posed long enough to ID as a Garden Warbler [not a Barred!]. Back at the slipway had the Red-breasted Flycatcher in a bare bush long enough for RL to get a few pictures. It then disappeared again and although seen off and on for another hour never show well again partly due to been chased by a Robin but the human traffic didn’t help. This was a Hull Valley tick for RL and I. 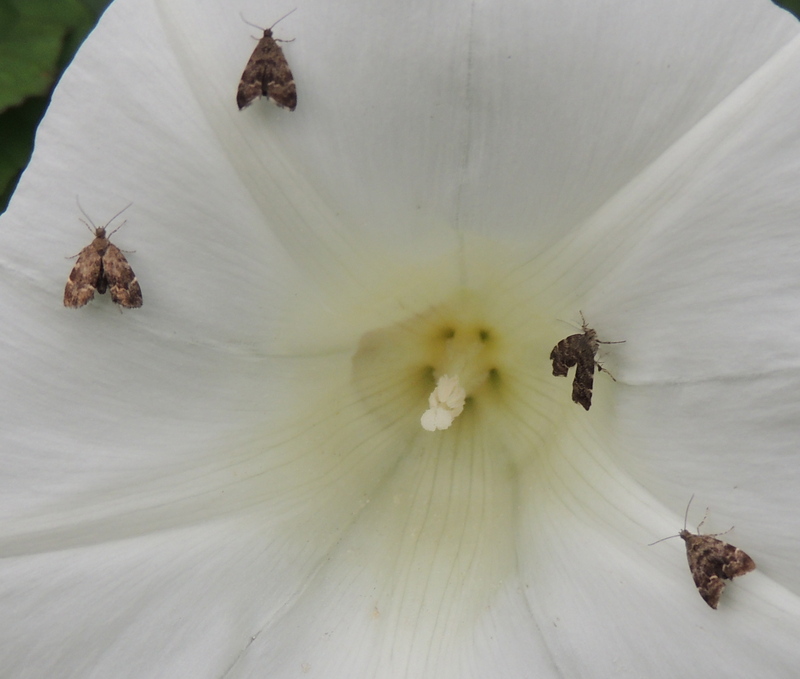 The only previous record we are aware of was one in Atwick churchyard c10 years ago. Found by Bill Curtiss it was suppressed because of a funeral service. Had quick look around Atwick churchyard but had no migrants. Also did Bewholme Hall pond but again no waders. 31 Little Gulls were at Hornsea Mere early evening. Also 5 Red-crested Pochard including at least two juveniles and one bearing a non-BTO ring, believe to be from a local collection, and an un-ringed but approachable Mandarin at Kirkholme Point. The 1st summer Common Crane was still lingering on Molescroft Carrs by Arram Grange on Tuesday and the female Scaup still on High Eske NR. To view the Crane walk the west bank of R.Hull north for c1ml. It flushes easily so don’t approach too close. 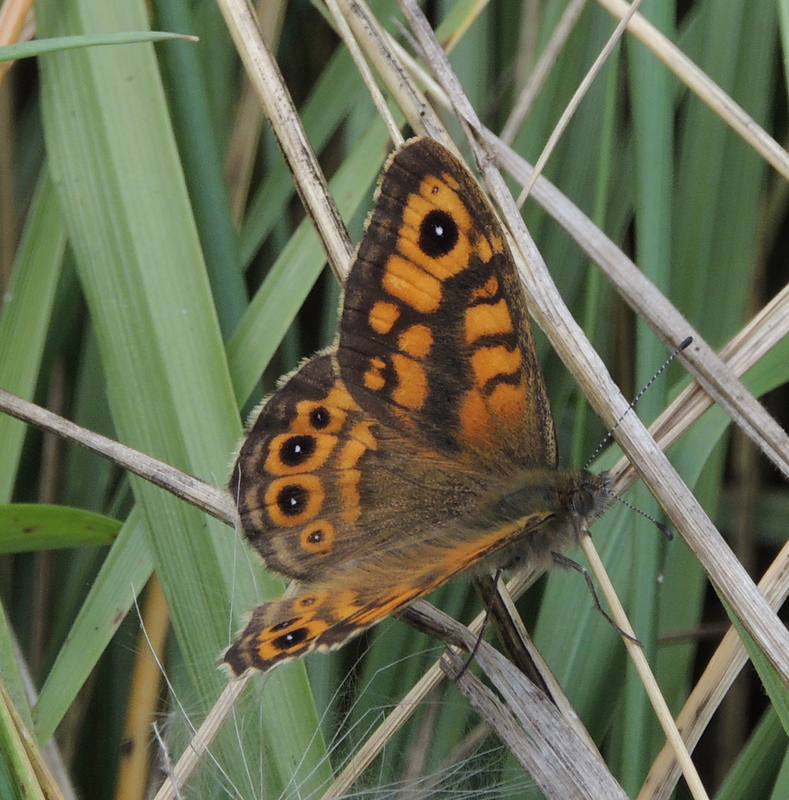 Also seen on Swinemoor at least twice including at dusk last Saturday. 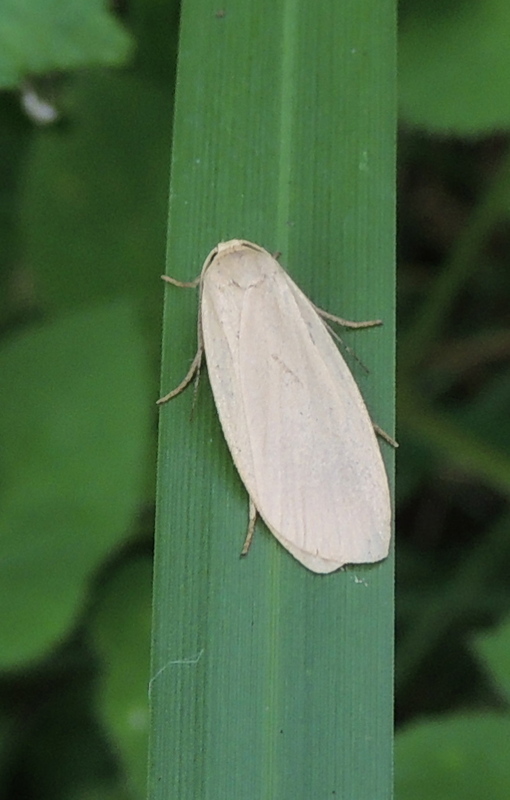 No reports of it north of High Eske NR recently although has been seen flying over the nature reserve when flushed. 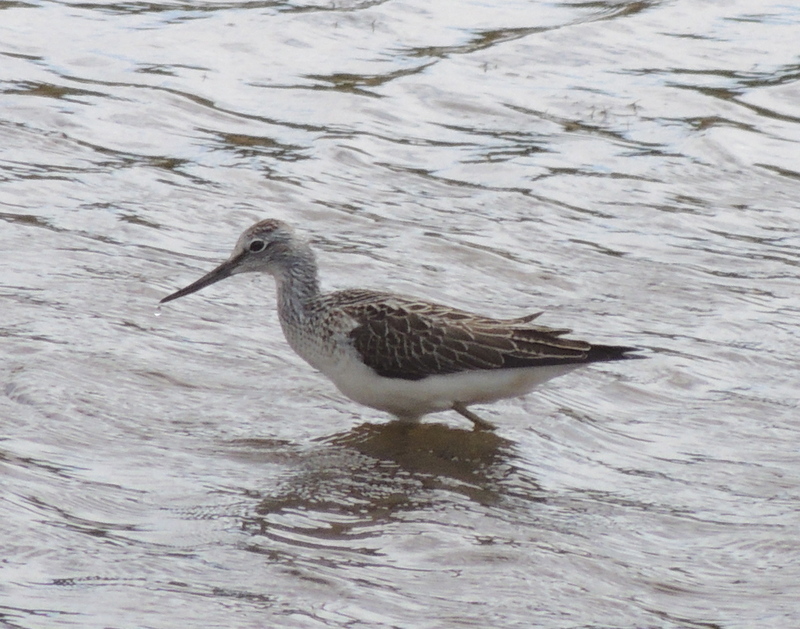 Also at dusk on Tuesday a Wood Sandpiper and 6 Ruff were on Swinemoor. 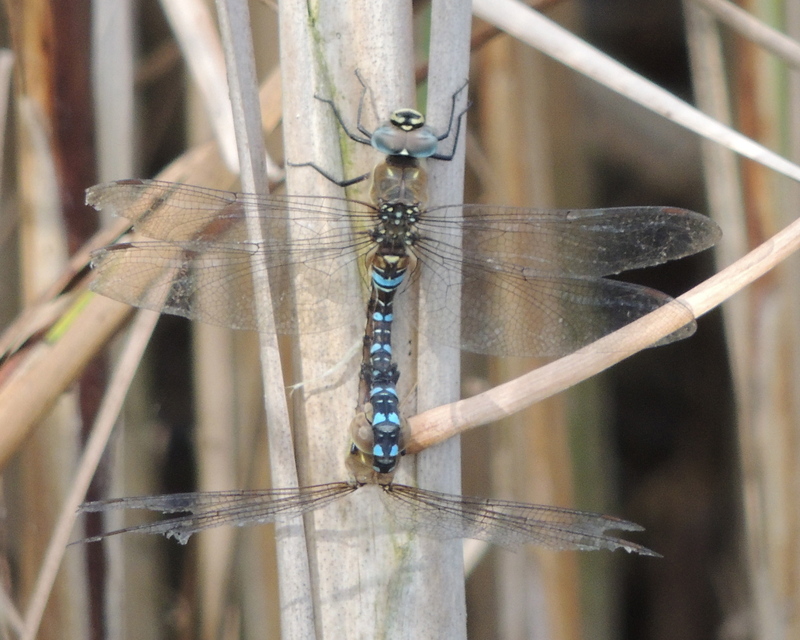 For recent sightings at Tophill Low NR check here. A Nightjar was recently seen in West Hull. A Wryneck was also in Hull late August. Following the presence of Whooper Swans and wild geese at High Eske NR on 4/11 things looked good for another interesting winter this has so far turn out to be a false hope. I hadn’t been up there for a month but Eric Clubley had and conformed that the Whooper Swan hadn’t stay on. 14/12 RL and ML visited High Eske NR on Saturday and did find a lone juvenile Whooper Swan and juvenile Pink-footed Goose. They also visited Hornsea Mere where the Grey Phalarope was again showing well from Kirkholme. Also both Great White Egrets, 2 Egyptian Geese and a Danish-ringed Black-headed Gull. RL and I had also seen the Long-tailed Duck and female Velvet Scoter on Friday as well as a very showy Peregrine, repeatedly harassing Carrion Crow on Swan Island. I also managed a distant view of the Grey Phalarope. Also earlier we had another Peregrine at Swinemoor as well as 410 Wigeon, 50 Teal, 11 Shoveler, 200 Lapwing, 15 Redshank, 2 Dunlin and 5 Golden Plover. A 2nd winter Iceland Gull was seen at Tophill Low NR on Saturday afternoon as well as the regular female Scaup. A Galloway and 2 Belted Galloways are now grazing South Scrub. 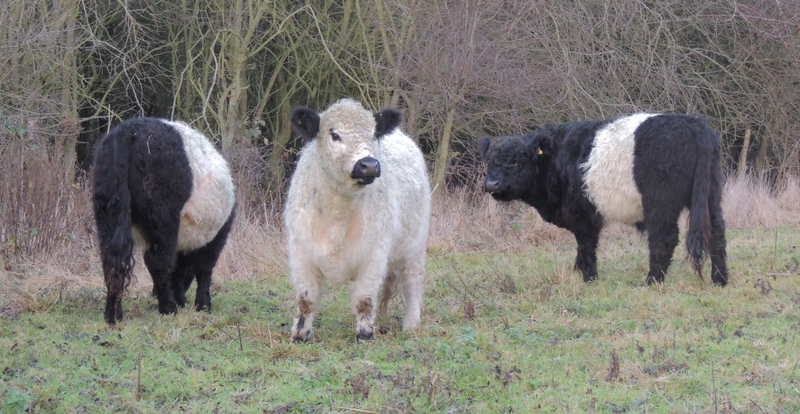 Told one of the Belted Galloways is very friendly. Unfortunately they seem to prefer to defecate on the footpath! A Black-throated Diver was off Barmston but no recent news on the Kumlien’s Gull. 15/12 I made it to High Eske NR on Sunday morning. Unaware of my friends’ previous visit had the pleasure of finding the Whooper with the Mute Swans and the Pinkfoot with the regular Greylag flock at High Eske farm. 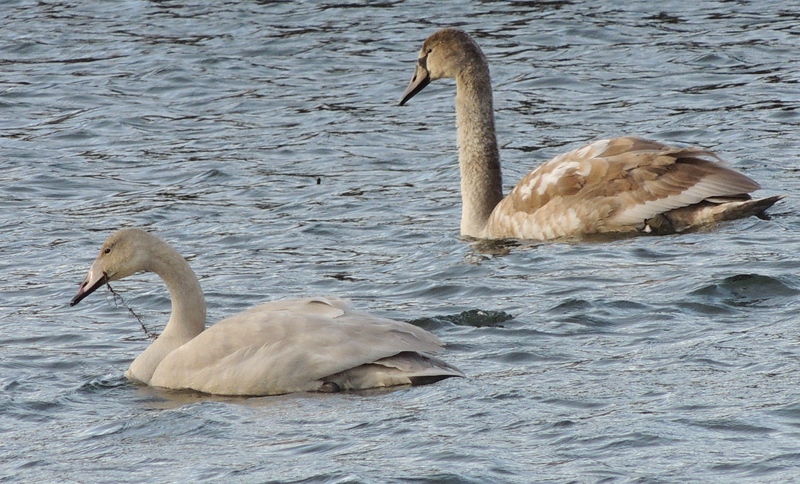 Juvenile Whooper and Mute Swan. The lack of Great Crested Grebes was of interest, in fact wildfowl hasn’t reached usual winter numbers yet with only Wigeon approaching them. Had a look at Leven Carrs. A cracking male Marsh Harrier flying west over the river was nice but otherwise only a Kestrel and Common Buzzard. Did some more birding this afternoon. See here. The Grey Phalarope at Hornsea Mere was only seen distantly off the Cormorant Trees today. Dave Bryan noticed a growth on the phalarope’s face but I’ve yet to check RL’s photos for it. Nothing else reported. No bird reports but Welton Waters was hit hard by the recent floods with detritus including an old frig washed into Brough Angling Complex. 24/11 Went to Paull with RL on Sunday morning. 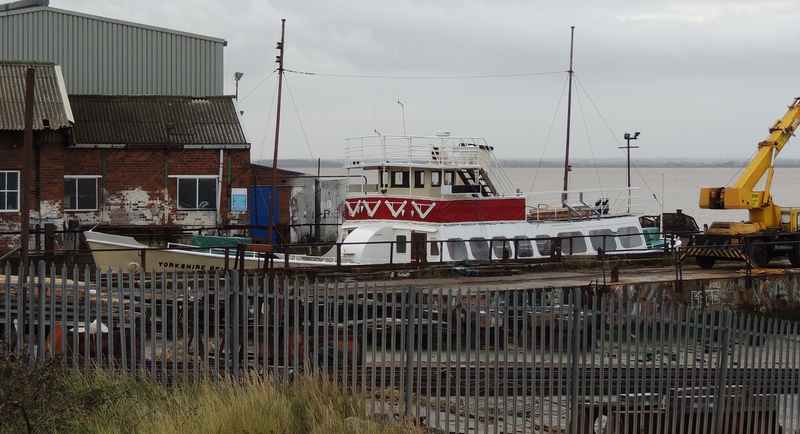 The Yorkshire Belle in Paull boatyard. Had a quick look at Salt End to check the tide then moved to the riverside car park where we met Pete Martin on his way out. 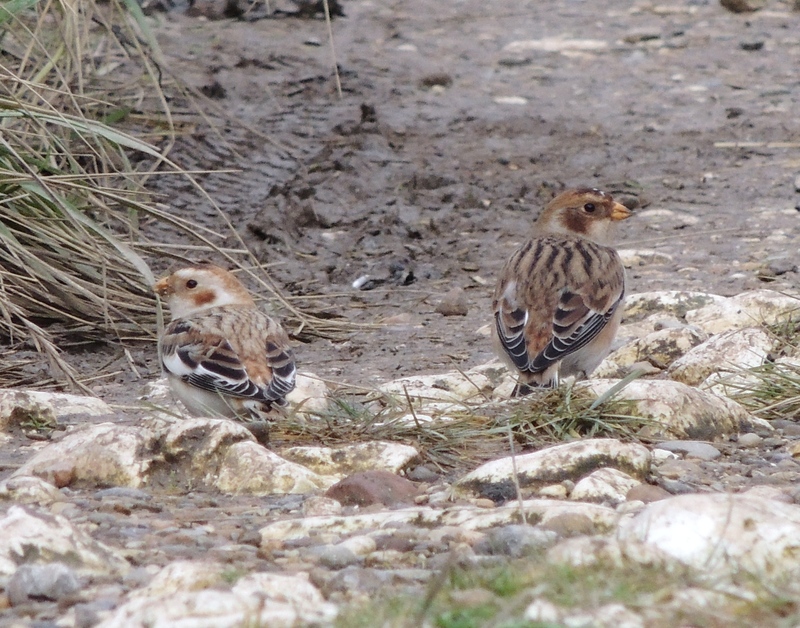 Had just had a Snow Bunting along the path toward the Strays. Had beed found yesterday. The cracking male was still present practically at the feet of Paul Martin. Got a few shots before it was flushed by an inconsiderate walker. Although we heard it call twice couldn’t relocated it. Roy and Paul were heading back to the car park when I re-found it a few yards further east. Was giving what sounded like a contact call and I wasn’t surprise to see a second drabber bird appear. 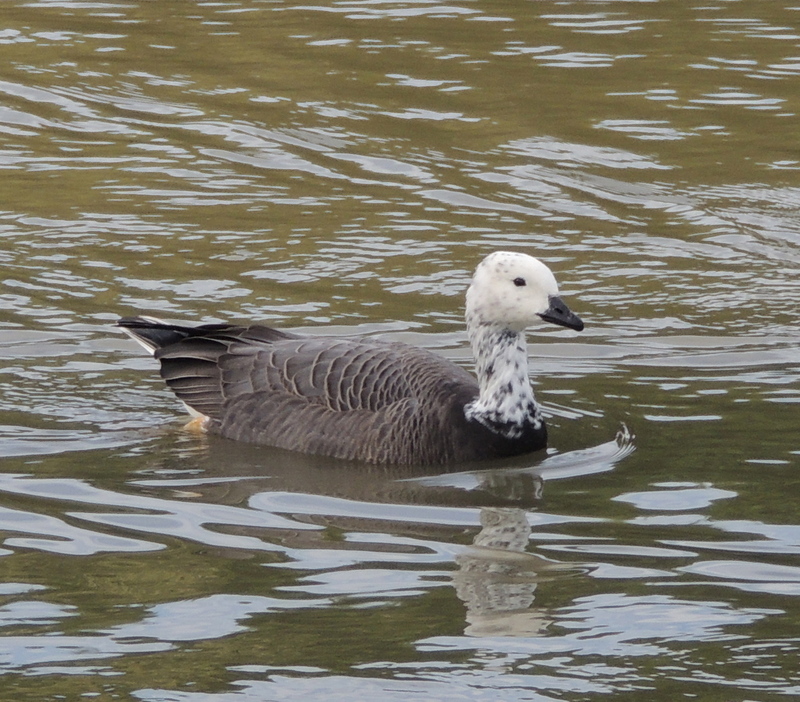 Got some more pictures and this time they were more settled, only moving a short distance when flushed. Having filled our boots we headed for the old lighthouses to view the foreshore off the Strays. 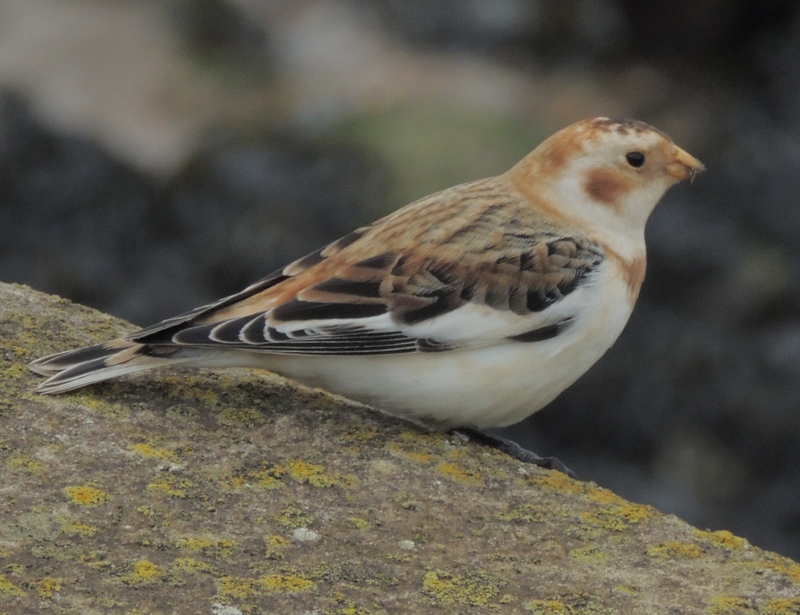 Bird totals were:- Wigeon 450, Dunlin 600, Black-tailed Godwit 10, Bar-tailed Godwit 4, Redshank 12, Turnstone 14, Ringed Plover 12, Golden Plover 8000, Grey Plover 6, Lapwing 200, a few Curlew and single Little Egret and Knot. 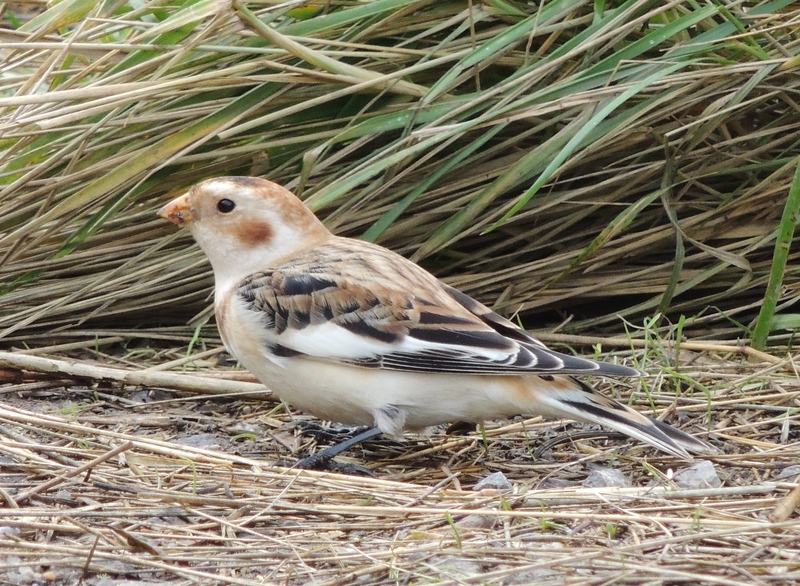 The Snow Buntings were still present early afternoon. For more recent news from Paull check here. Next went to Swinemoor. No sign of last Sunday’s 1500 Wigeon but a good number of Lapwing as well as 5 Dunlin, Common Snipe, 3 Redshank, Golden Plover, 5 Teal and 6 Greylag Geese. Ended the day at Hornsea Mere. The inevitable Great White Egret was on “tree Island” but a distant male Red-breasted Merganser was new. Unfortunately not at the same range as the drabber bird last month [see here]! 5/10 On Saturday afternoon went for my 4th [and last?] 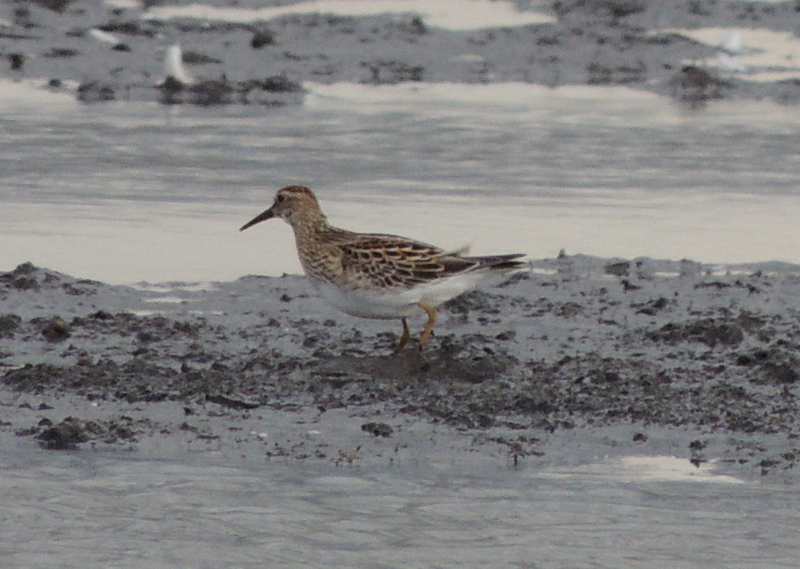 view of the Swinemoor juvenile Pectoral Sandpiper found a week ago. As before it was on it’s favoured pool just south east of the humpback bridge, accompanied by the usual Ruff. Again both stupidly approachable. Nearly flushed by a dog but by luck [or decency on the part of it’s owner] it decided not to run through the water. 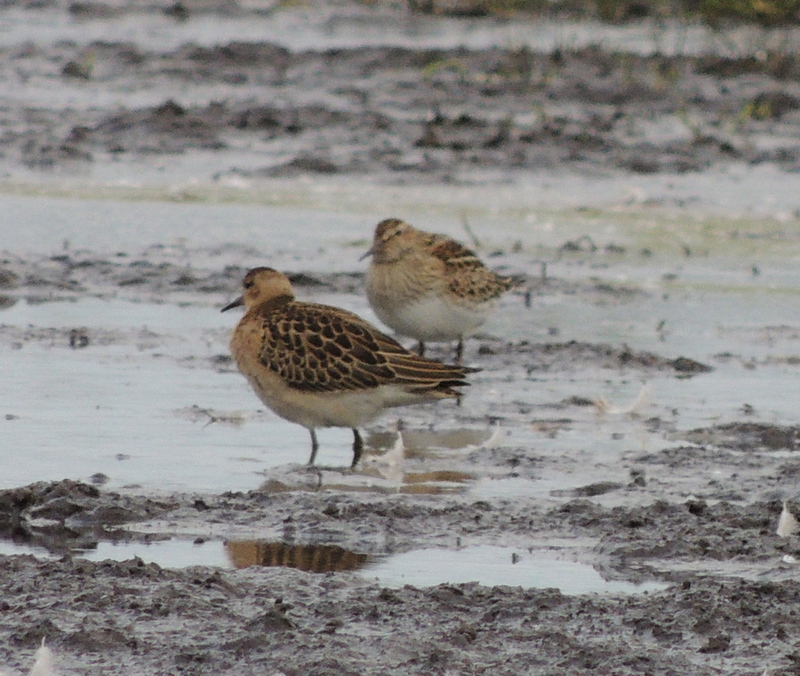 The other remaining pool further north which had held the Ruff and Dunlin on Sunday was nearly dry. 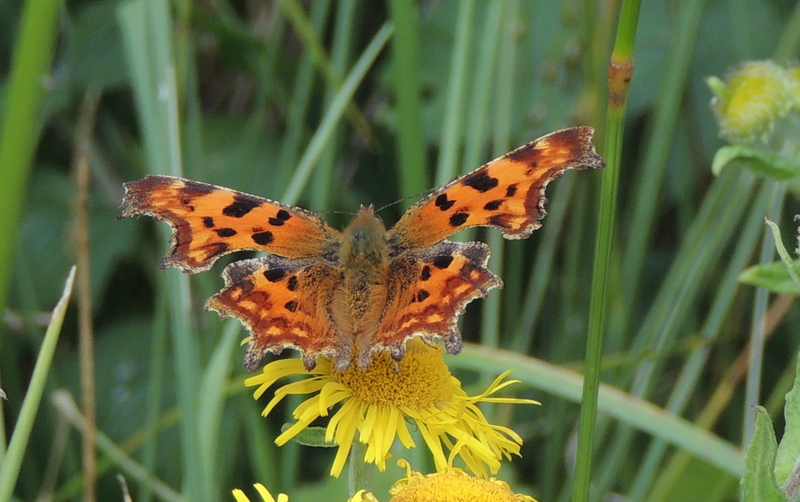 Moved to High Eske NR. Walked directly to Leven Canal in hope of owls and other birds of prey but nothing doing. Timed my return south so that having completed the circuit of High Eske would be in place to see any waders arriving to roost. 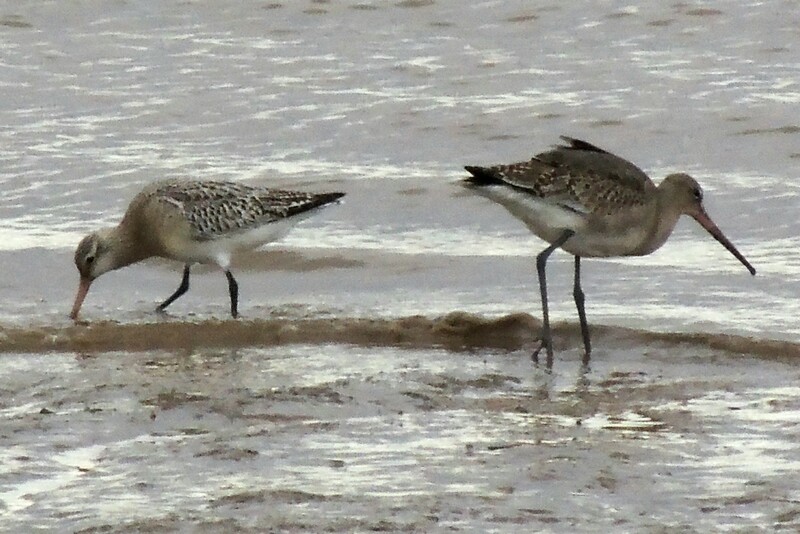 However despite Tim Cowley reporting both waders missing to the south neither arrived. 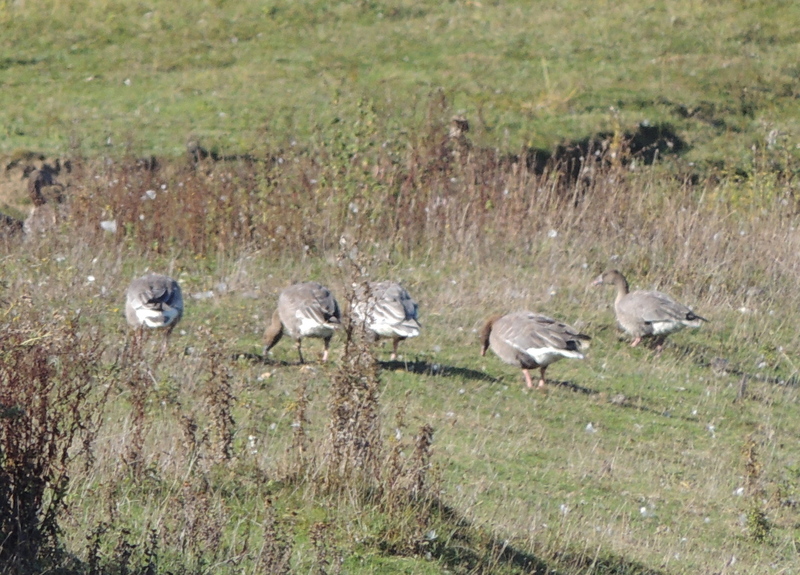 Also no reports of either roosting further north at Tophill Low NR during the week. 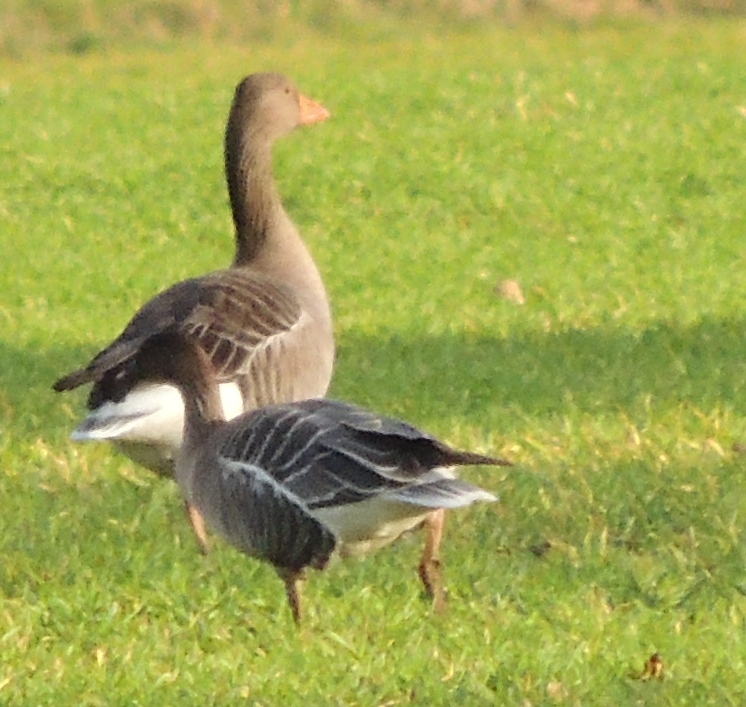 The wildfowl numbers were approaching winter numbers including 400+ Greylags but nothing unusual yet. 6/10 Went to Tophill Low NR with ML and RL on Sunday morning. A Great White Egret was seen earlier over North Marsh by, among others, Dave Tucker who’d also struck lucky with an Otter. The Egret was seen again late morning. Joined JH in car park hide. 11 Pintails on the reservoir. Walked south to Watton NR. 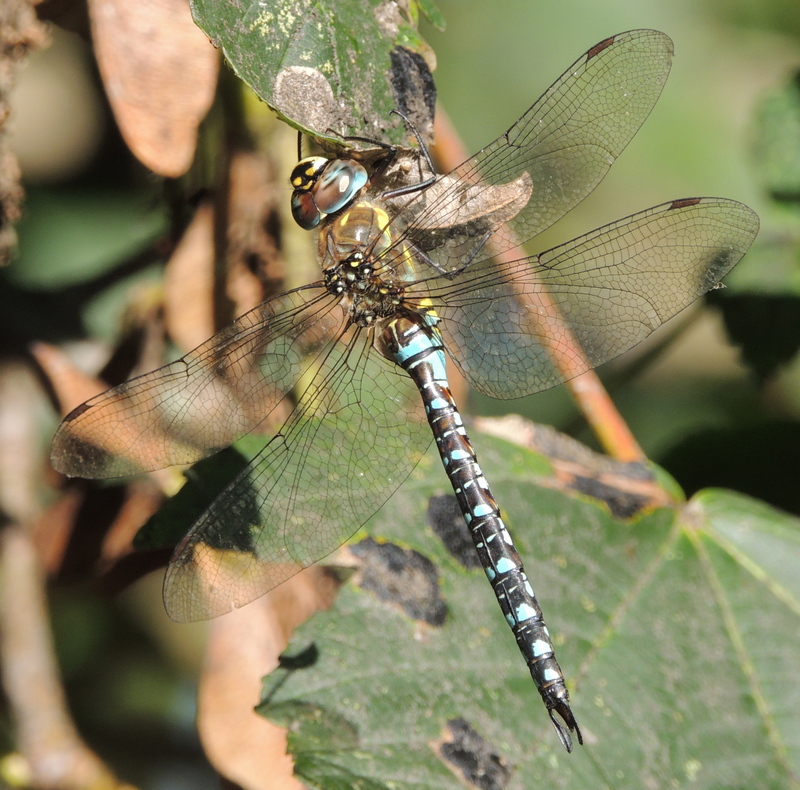 Still a good number of Migrant Hawkers and Common Darters on the wing, as well as a few Speckled Woods. Met Geoff Barker as we approached the hide and were assured there was nothing of interest. However on immediately opening the flaps 12 Pink-footed Geese were seen with the Greylags then while trying for a Garganey, among the Teal, I found a Jack Snipe bobbing at the back. 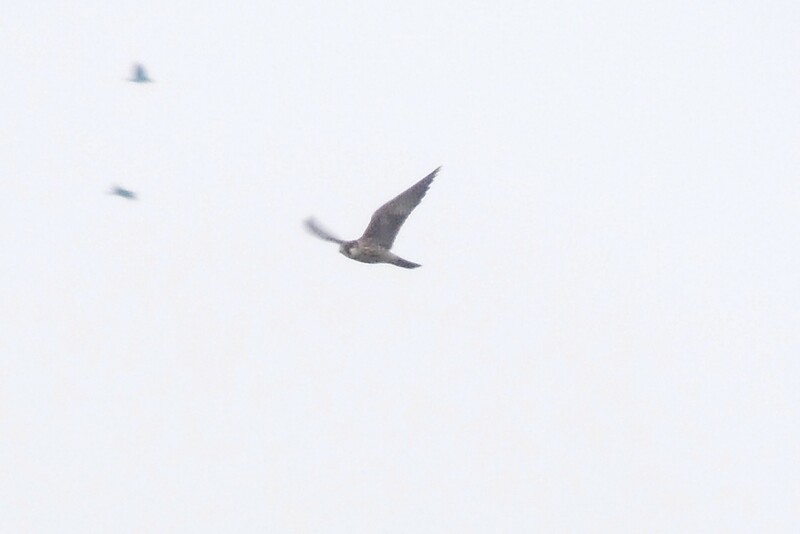 Also another 3 Pintail and 2 late Swallows. While we were in the hide RL was on the opposite side of Barmston Drain with Hull Daily Mail photographer Kate Woolhouse. He had done an interview with Hull Daily Mail’s James Campbell about HVWG’s concerns regarding the sale of Watton Nature Reserve, during the week. For details on the sale check here. 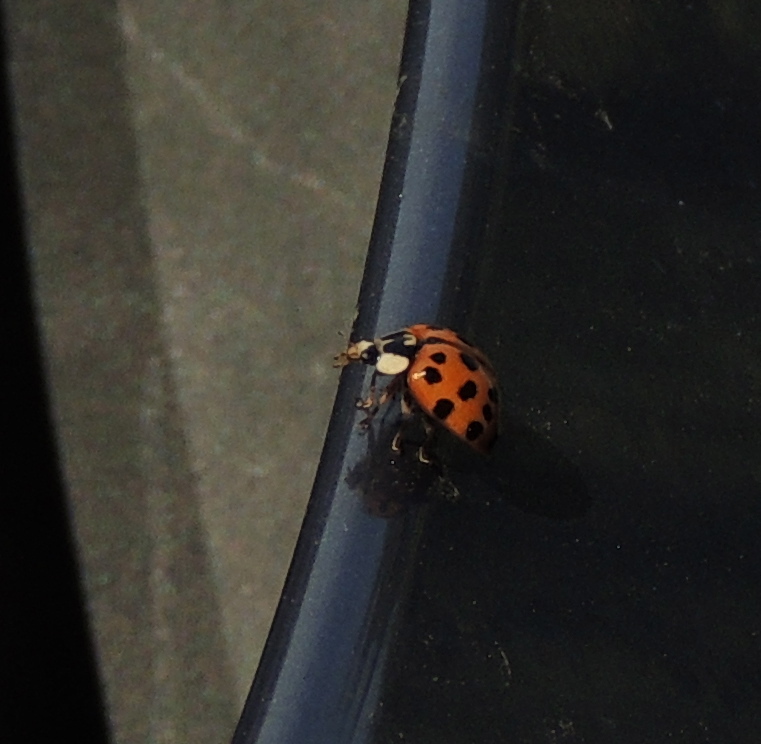 Moved to Atwick this afternoon for a look for migrants but the only thing of notes was Harlequin Ladybird I found on JH’s car’s bonnet as he pulled up. A first for RL. Moved to Far Grange which was also quiet but had a Kingfisher at The Lakes which was good for the site. Did a sea watch from the east end of Far Grange golf course but only a Red-throated Diver and a juvenile Gannet of interest. Both Richard Jennings and Tim Cowley had only the Ruff on Swinemoor this morning. Richard also had an interesting pale Buzzard over Leven Carrs but thought only Common. I am not working this week so should get a chance to look for it. Went to Tophill Low NR with John on Sunday morning. 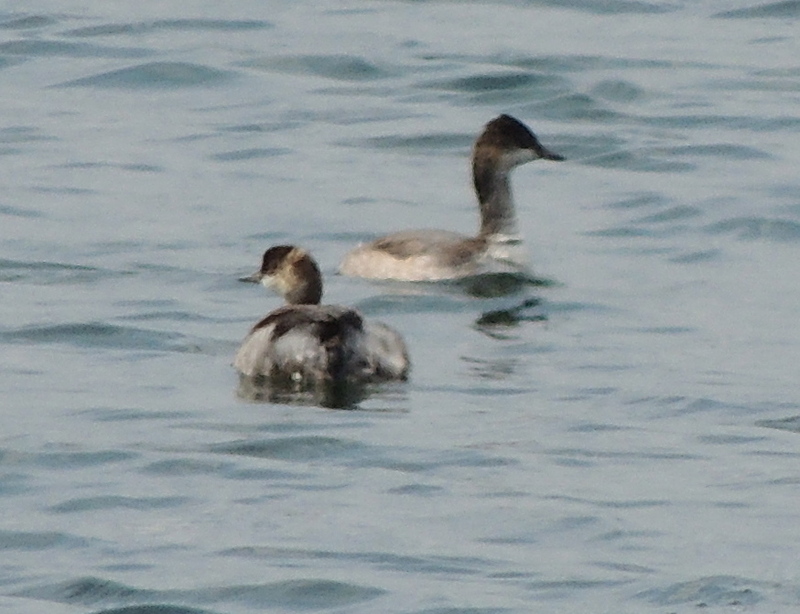 One of the two juvenile Black-necked Grebes present for a week now, was still on D res. Walked up to Hempholme Meadow where we witnessed a female Marsh Harrier carrying a decent size rabbit over Struncheon Hill pond to two juveniles on the east side of the River Hull. Whether this is the fledged family from South Marsh East or an additional brood is up for debate but they have been in the area for a least a week. Had a brief view of a Kingfisher on North Marsh but missed a mother Water Vole with a young in tour. This afternoon did the some end and had a Ruff on Watton NR then Greenshank and Green Sandpiper on South Marsh West. 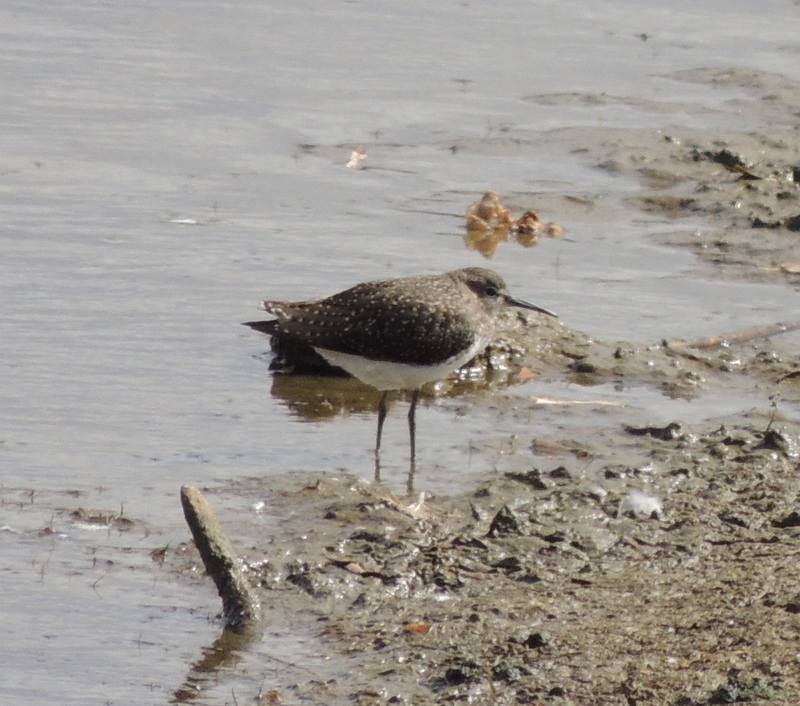 Volunteers were working to create wader areas on South Marsh East. 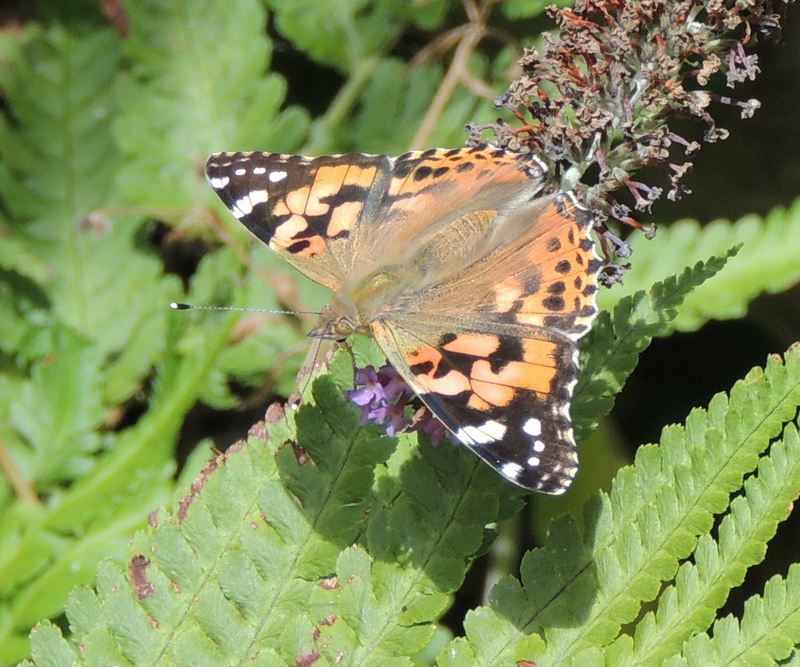 Good day for butterflies with at least 4 Painted Ladies reported. 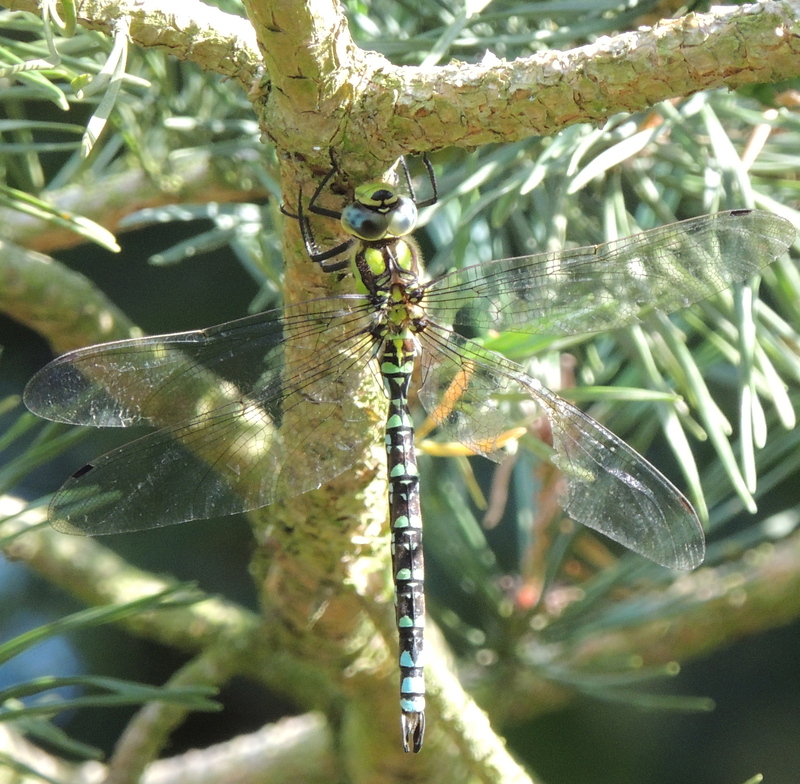 Good number of hawker dragonflies on the wing. Swinemoor continues to dry out with no sign of any serious rain in the near future but some decent pools still remain where Roy and I had Little Egret, 2 Black-tailed Godwit, 2 Greenshank and Redshank on Wednesday. 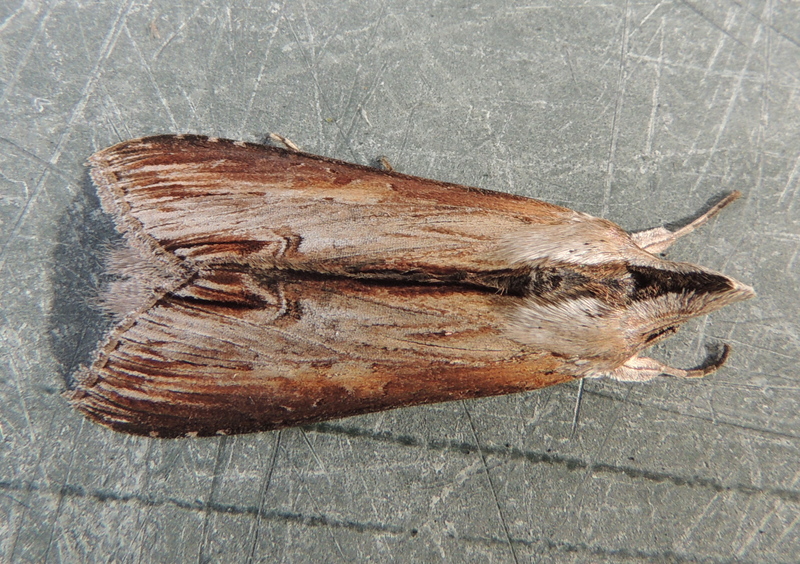 Trapped a Star-wort moth at home in Cottingham overnight. Previous records in Yorkshire have been confined Spurn Point.